The Thumb-buster is now a reality! And if you go to the London Acoustic Guitar Show in 2 weeks, you’ll be able to see, hear and try it. If you’ve never heard of it, that’s because I’ve been sworn to secrecy. A teaser article (at left) just appeared in the UK Acoustic Magazine that just hit the newsstands (thanks to them for letting me post this) – the issue with Andy McKee on the cover. Click the thumbnail to open a PDF to read the story and see the unfinished prototype. You may remember Paul from my last NAMM blog. 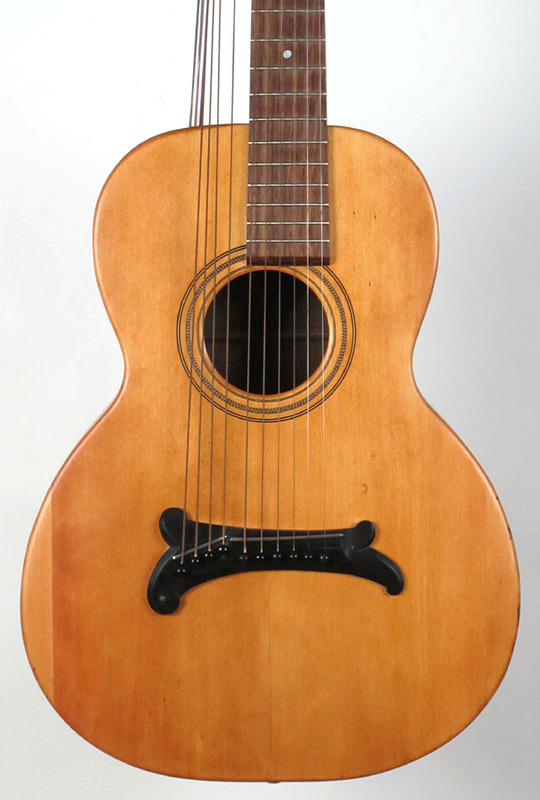 A comment added there by Paul refers to the “Text Generation model” harp guitar – a reference to his wild idea of creating a new harp guitar model for the younger “texting” generation. I honestly never expected him to follow through with it! Why the “text generation”? Well, because they are naturally growing up with superior thumb-plucking skills due to all their incessant thumb-texting! This was Paul’s sudden realization after playing the 1890’s Dahlman/Akeson harp guitar I had taken to NAMM for our little interview (seen in article Photo). This instrument, as explained in Dahlman’s patent, and clearly designed as such, is meant to have its sub-basses played by the left hand thumb. Strange? Not really. Within minutes, Paul was improvising some Blues on the Akeson HG and shooting video of the whole thing. He would not put it down…my “interview” seemed to be about 5 minutes of discussion and 2 hours of watching Paul play and sing and giggle like a kid who’s seen his first guitar. And perhaps, in a way, he had. Yes, it’s a whole new concept (albeit 120 years old) for guitarists and harp guitarists alike, and Paul thought it valid enough that he’s been quietly working on the prototype all this time: a new 4-bass harp guitar that “anyone can play.” Of course, one can still play the subs in the traditional way with the right hand thumb, but the real point is to keep it simple and let the right hand do what it’s always done (strum, pluck, fingerstyle, whatever) and let the unused left thumb do some new simple plucking of the root notes. I imagine one would tune the basses to the key of the song in various I-IV-V-II combinations. It looks like Paul’s subs will be in a straight line – perhaps he found this easier than the “thumb circle” that the Dahlman/Akeson uses (which I kinda like). I can show you that instrument now, after having the top re-refinished and photographing it last night. Note the ugly top re-finish, and also what looks like a top repair (a new piece of wood?) on the left lower bout. I’d always wanted one of these iconic and historically important specimens, and one day saw this very instrument at Scott Burwell’s (yes, the Holloway CEO)…he was the eBay winner way back! Back to the instrument. Though patented and presumably marketed and sold by Dahlman (see this catalog), it seems that most (?) of these instruments are marked “Charles A. Akeson.” I say that without actually having seen a decent image of one of these labels/stamps (I’m sure I’ve seen a legible image, but don’t seem to have any in my files). Here’s my own stamp, which doesn’t have much left. I’ve seen several of these instruments, many of which are quite fancy. This is clearly the “budget” model, with solid oak back and sides. Though I’m not a fan of refinished vintage guitars, the top of this was so ugly (the back & sides were great), that I decided to spend some money to have it re-done. My restoration person (name withheld to protect my repair queue…) was able to actually chip/scrape off a bit of the heavy over-finish and see the original color and finish beneath. He was then able to remove it and apply a new hand rubbed colored finish that matched the original very accurately. The non-matching piece is actually part of the original 4-piece top (I said this was a budget model!) – there is a matching symmetrical piece on the opposite side. The piece on the left is just different enough grain-wise that it accepted the finish very differently, noticeable more or less as is it angled. Here’s a closeup. And here’s the infamous “basses-in-the-round” set up of the headstock. I love the design and the geometry of this craziness, especially how the neck’s 3 low string tuners have extended shafts to put the gears and knobs at the proper spot. Understandably, Paul and his collaborator chose to eschew the carved violin scroll. Like his Vintage brand parlor 12-string, I expect this instrument will be another huge bargain. I’m embarrassed to say that I haven’t yet strung mine up with proper strings yet (I’ll probably do silk & bronze or perhaps some Thomastik composite-y thing. I’m guessing that Paul’s will sound superior, regardless. 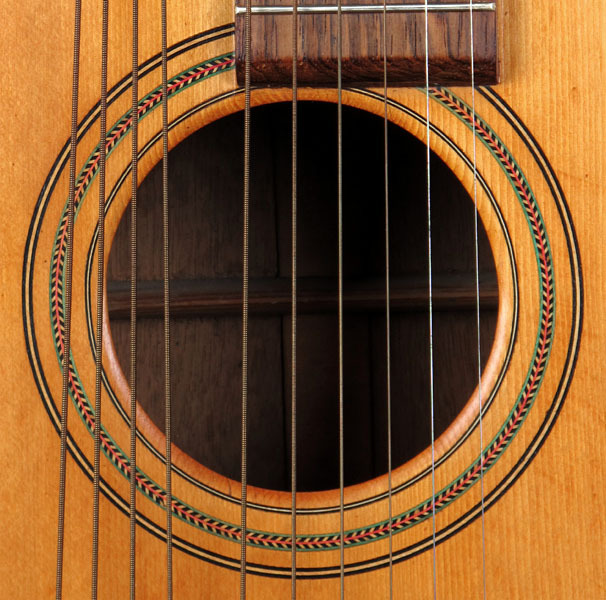 English acoustic guitarists – go check it out on the 22/23rd and let me know! Just picked up the finished Thumbuster prototype from luthier Richard Meyrick. Rich works out if his workshop just out side Abergavenny, South Wales. He has done a great job in presenting a modern version of this old Americana concept. Sound projection is massive. Made from Welsh oak back and sides, Welsh bog oak bridge and fingerboard, Welsh maple bound and solid spruce top, now going home to North Wales to work out a demo piece to video for the net and the show in London. Will keep updating progress and I hope there will be lots of interest from everyone at the show. My thanks to Gregg for introducing me to this concept and it’s a fascinating one yet fundamental in concept and just by an initial tinker, I can get a great 12 bar groove blues going, just need to get my brain in reverse mode to connect with the left hand thumb! A special thanks to Chris deMaria at Fishman USA for supplying the matrix system pick up that has contributed to the runaway success of my Paul Brett electro/acoustic 12 string by Vintage. 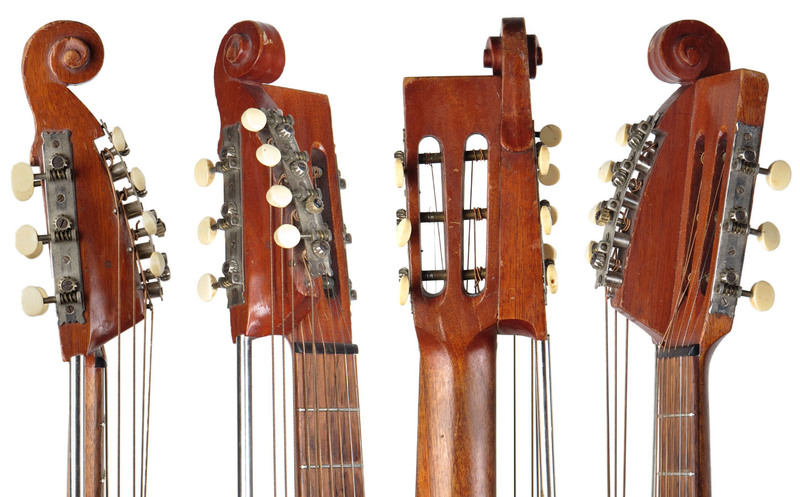 Great to see these exotic instruments, at the same time reading the high level overview. Hope to see you at winter NAMM 2013. Wow, Paul’s mastered it in 1 week – check it out!